Former Northern Echo editor and journalism training expert Peter Sands has joined Northcliffe Media in an editorial consultancy role. Peter, left, has been brought in to provide editorial support and advice for Northcliffe editors as new chief executive Steve Auckland continues his restructuring of the business. His duties so far have included advising on the changeovers from daily to weekly publication at the Torquay Herald Express, Scunthorpe Telegraph and Exeter Express and Echo. Peter will continue with his existing work as consultant editor of Press Association Training and director of Sands Media Services alongside the new part-time role. 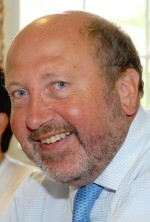 He told HTFP: “I have been impressed by the fact that Steve Auckland is introducing radical changes to rebuild the business rather than just sitting on his hands and ordering the next round of cuts. Peter, who also chairs the judges at the annual Regional Press Awards, has had previous experience in helping oversee frequency changes at Northcliffe titles. In 2007 he was brought in to help Bath Chronicle editor Sam Holliday create a new look as the title moved from daily to weekly. His new role at Northcliffe is designed partly to replace the work currently carried out by Alex Leys, who is leaving the business next month. Alex, a former editor of the Leicester Mercury, Derby Telegraph and Lincolnshire Echo, stood down as Northcliffe’s deputy managing director in April but was kept on in a consultancy capacity. Said Steve: “Alex is leaving at the end of September and as he comes away from the business Peter is picking up in a consultancy capacity where Alex is leaving off. A very positive appointment. Someone who certainly knows his stuff and has the respect of a lot of editors. Gingerelvis is spot on. Peter is a top man. I had the good fortune to work alongside Peter for a while in the Westminster Press editorial training centre and admired his flair for design, typography and the use of pictures. He also has a great way with people. A smart signing by Steve Auckland. While I don’t disagree with either of the comments above, I wonder how involved Peter will actually be. Certainly, it’s hard to imagine he was involved in the first edition of the weekly Torquay Herald Express, given the design of the front-page was, IMO, an unmitigated disaster. I agree – a smart move. It’s a shame that they can’t do that on the commercial side. I say that because most of the strong commercial people have already left – forced or otherwise!!!!! Has any newspaper re design ever, anywhere in the world, resulted in a sustained change in sales performance ? Point taken Spanner but it’s not about sales. There are a lot of editors out there who know little or nothing about how to design, pace etc.